Mary’s memoir recalls how her parents faced illness and disability throughout their whole lives. This affected both their own personal lives and health but also changed family life for Mary and her siblings. Mary first speaks of her Father’s ill health: ‘Now father was still a miner and suffered from what they called in those days ‘bronchitis’ but we now know it was the coal mines coal dust on the lungs’ (9). Here we can see a link between labour and illness, showing that the work of the working class was a cause of ill health and diseases. Much as Arthur McIvor and Ronald Johnston note, ‘Britain had the worst rates of pneumoconiosis and bronchitis in Europe in the middle of the twentieth century, and a key cause was the inhalation of dust at work, especially in the heavy industries, including coal mining’ (McIvor/Johnston, 2016, 1). This is shown in the case of Mary’s father as his ill health was brought on due to inhaling the dust from the mines. Through this we see how poor working conditions were a source of illness as Mary’s father will have spent many hours a day inhaling the dust within the mines. 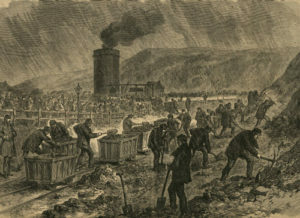 Picture of coal mining in England in the 1800’s. Showing the conditions that Mary’s father was working in. Mary’s father faced a dilemma as although his job made him unwell, his family depended on his wage . Mary’s mother did not work full time and Mary and her sisters were on a low wage at the hosiery factory, meaning their wages alone could not support the family. As the main breadwinner, her father, although in very poor health, will have had to continue working in order to support his family and keep them out of the poverty and starvation that many working class families were facing in the 1900s. Mary does mention that her father’s illness meant they ‘were not very well off’ (9), suggesting that perhaps her father’s illness meant he had to take time off or perhaps had to reduce his hours due to his poor health. As Ian Gazeley describes, ‘…the spectre of illness and disability is always confronting the working-man; the possibility of being from one day to the other plunged into actual want is always confronting his family’ (Gazeley, 2003, 40). As Mary’s father did not want his family to be forced into poverty he continued working in the coal mines even with bronchitis. Mary doesn’t say when her father stopped working but mentions that his ill health was long-term leading up to his death: ‘My father died at the age of 76 but had been in poor health for quite a few years before he died, but was always cheerful and happy & could always see the funny side of life’ (11-12). This shows that although Mary’s father was ill for most of his life, he did not let this affect his work or in fact his disposition, allowing Mary to remember her father as a man who did his best for his family and remained happy amidst his poor health condition. Mary’s mother also faced long term illness because of a disability which left her unable to walk properly: ‘my mother altho she lived to be 84 could not walk for 40 years she had that painful & crippling Rheumatoid arthritis’ (40). This will have put immense strain on the family, in particular as Mary’s mother would have been unable to carry out domestic duties in the home, leaving perhaps Mary or her siblings to do the housework around their own jobs. A typical ‘3 wheelchair’. The first wheelchair which Mary’s mother used. 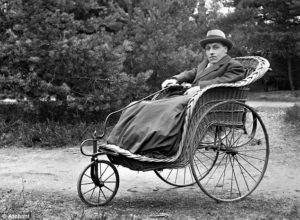 ‘…father heard of a factory in Nottingham who made wicker chairs…just at that time children’s push chairs were coming into fashion. So father and my older sister went to the factory & asked if an invalid cane & wicker folding chair with 4 wheels could be made. So there again mother got the first folding invalid chair’ (21). Mary’s father decided to ask about combining the 4 wheels of a children’s pushchair with the traditional design of a wheelchair, creating a more mobile and easier to store away wheelchair, the first of its kind. Through this we can not only see how Mary’s family cared for one another but also how things were advancing, allowing illness and disabilities to become easier to live with and manage. 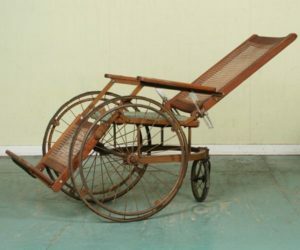 A 4 wheel chair, similar to the one that Mary’s father had made for his wife. McIvor and Johnston also note that the textiles industry was a workplace in which one could become ill due to inhaling dust (McIvor/Johnston, 2016, 1). As Mary worked in the hosiery industry, I wondered if this affected her throughout her younger years. However, reading through Mary’s memoir she does not speak of any illness she had herself, reflecting perhaps that the conditions within the textile industry was improving, with less people becoming ill from working in the factories. Whilst Mary does not mention illness during her younger years, she does note poor health as an adult. This is shown as Mary writes, ‘I had to stop writing as I was not well & felt the weight of my years’ (16), she also describes ‘two operations (of several years ago)’ (29), which leave her feeling ‘tired’ (29). Whilst Mary suffers illness through her life, the fact she doesn’t really talk about her own health shows that she does not let it affect her life, allowing her to remain happy and independent in her later years. Gazeley, Ian. Poverty in Britain, 1900-1965. Hampshire: Palgrave Macmillan, 2003. McIvor, Arthur and Ronald Johnston. Miners’ Lung: A History of Dust Disease in British Coal Mining. Oxon: Routledge, 2016. 1: 719 TRIGGLE, Mary Laura, Series of autobiographical letters, MS, pp.25 (c.4,000 words). BruneI University Library.